For those of you unfamiliar, #GivingTuesday is celebrated on every Tuesday after Thanksgiving and the days following Black Friday and Cyber Monday. Founded in 2012 by the 92nd Street Y – a community and cultural center in New York City − #GivingTuesday has inspired millions of people to give back and support the causes they believe in. According to their website, over 2,500,000 gifts have been given and over $300 million was raised online to benefit a tremendously broad range of organizations. Furthermore, much more was given in volunteer hours, donations of food and clothing, and acts of kindness. As previously mentioned, November 27th is the designated day for those to either join the movement and offer a form of giving. It can be some of your time spent in your local community, or a donation towards an organization, charity or event that you feel best exemplifies the meaning of #GivingTuesday. After officially becoming a non-profit organization last year, Rainbow Rabbit will now be taking part in Giving Tuesday 2018. It’s been a busy year for us, and we take much comfort in knowing that our program has come to the aid of thousands of children simply looking for hope that their future will indeed be even brighter and more colorful as Rainbow Rabbit himself. Of course, by sharing our stories, we inspire others to give. Has Rainbow Rabbit has inspired you or somebody important in your life? 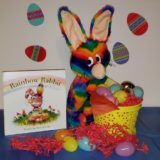 Your essay or video can not only inspire others in return, but help Rainbow Rabbit continue its mission of empowering children, parents, and educators to create a positive environment that celebrates unique differences and rewards kindness. Feel free to share your story here. Throughout November, team Rainbow Rabbit will keep you updated on the progress of Giving Tuesday 2018. Thank you kindly in advance for any contributions made towards Rainbow Rabbit! nextGiving Tuesday is November 27, 2018: Share stories & inspire donations!